Welcome to the Lake Osoyoos Sailing Club! 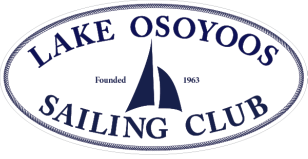 The mission of the Lake Osoyoos Sailing Club is to provide a unique lakeside facility offering affordable recreational access to Lake Osoyoos for individual and family members in their pursuit of sailing and naturally-powered water sports. The Lake Osoyoos Sailing Club wants to ensure that Lake Osoyoos remains mussel-free. To find out what you can do to protect our lake, please click on the logo for Don't Move A Mussel.